« THE NEW SUPREME COURT LITMUS TEST: ARE OBAMA’S PROGRAMS CONSTITUTIONAL? Politics is no longer a spectator sport. Those in the grandstands must leave their seats and come down on the playing field to help their side score. That is the key lesson of the Obama campaign. He didn’t just have supporters. He had campaign workers–millions of them. The Internet has made each of us the center of our own political campaign. We are the campaign. The days when the candidate and a small group of professionals ran things–and the rest of us chipped in money, showed up at rallies, and voted–are over. Now each of us must conduct our own campaign within our own circle of acquaintances, until the circle spreads to include thousands of voters. Too many of us still labor under the delusion that politics is a top-down game, driven by the manager and candidate whose initiatives filter down to the lowly campaign workers, the foot soldiers on the ground. We wait for our phone to ring or an e-mail to arrive telling us what to do to help win the election. But in today’s politics, those initiatives have to come from us, not from on high. This means one thing: you are the campaign! You can be your own campaign media guru, strategist, and manager. You don’t need money. You don’t need fame. You just need to be able to produce cogent and effective campaign messages to send to your friends and associates by e-mail and to the world at large on YouTube, Twitter, Facebook, and whatever else is invented between now and when you read these words. Conventional top-down media-driven political campaign isn’t working anymore because we don’t believe what we hear from strangers. And here’s an interesting corollary: The more we disbelieve those we don’t know, the more we do believe, and rely upon, those we do know. The old regimen of media propaganda is swiftly being supplanted by old-fashioned word of mouth–recommendations from friends, trusted colleagues, and established, credible commentators–as our main source of information. In this new era, we–the party’s and candidate’s supporters–must do the heavy lifting. It is we, not the candidate or his staff, who have to get the message out. The campaigns themselves–with their budgets and exposure–become ammunition factories producing shells for us to fire. Why? Because we have credibility they do not. We each have our areas of expertise. A doctor or nurse’s opinion of Obama’s health-care bill will carry great weight with his or her peers, relatives, and friends. A small business owner will be very credible discussing the problems he’s facing in the marketplace and how Obama’s policies are stopping him from expanding his business or creating new jobs. The opinions of soldiers and their families carry great weight when they report on how Obama’s Afghanistan policy is hampering the war effort and emboldening the opposition. A construction worker’s opinion of the housing market will get our attention. When a banker or investor describes the chaos Obama has caused in the markets, everyone listens intently. We are all experts. We are all media creators now. We are all the campaign. Our audience is a large circle of people and we’re at its center. We have school and college buddies, office colleagues, family members (even if we have to climb pretty far out on the family tree), members of civic and fraternal groups, clients, social friends, and other associates. We have the parents of our children’s friends, people we know from their schools. There are people we forward jokes to, or share articles about our favorite sports teams with, or send out Christmas cards or letters to every year. If you want to make a difference in 2010, now’s the time to start reaching out to all those people to spread the word. They are your constituents–your electronic precinct. The Internet allows us to reach our circle with little effort and no cost. You do it all the time. The only difference is, in 2010 you should make it part of your campaign. In the old political-machine days, campaign workers were each assigned an election district or precinct to canvass. Their political task was defined geographically, and our politically minded ancestors walked from one house to the next spreading the message–identifying favorable voters, working on the undecided, answering arguments or questions, resolving doubts, and, finally, making sure their party’s supporters actually voted. Now our precinct is an electronic network that can spread across the nation. It includes everyone we know and those strangers who we can reach. They don’t live in one neighborhood; but they are our beat nonetheless. They are the votes we need to deliver on Election Day. So follow the example of the precinct workers of old Tammany Hall: Make a list of your constituents and go talk to each of them–by e-mail, by Twitter, by YouTube, by Facebook, even by phone. Sound them out about their political preferences. Learn what issues matter to them. Make notes on their criticisms of Obama–and their positive ideas, too. Figure out what gets them motivated. Then craft a strategy for each voter on your list. Formulate a plan to win them over. Work on what issues to push, what themes to strike, and how to approach each voter. Remember to think of yourself as a publisher. The job of the campaign staff, and the candidate, is to produce ammunition in the form of issue positions, statements, and campaign material. Yours is to fire it off, distributing it to the right people. You’ve probably been trying your friends’ patience by forwarding jokes or baby pictures via e-mail. Now you can use the same tool to send something they may actually be interested in: videos of a promising candidate or stories about his or her campaign speeches. Surf the Web for articles and other materials that are helpful to your campaign. Reach out to other sources of information that might generate good material for your campaign (i.e. 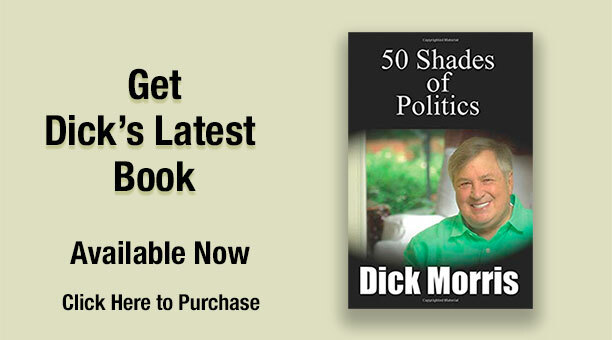 make sure to get our columns from DickMorris.com). Search far and wide for ammunition–material to send to your list, aiming each blast at the right targets. So it’s up to the grassroots–which means us. Don’t wait for instructions. Don’t look for leaders. Take politics into your own hands and mobilize your precincts!